R&R, military slang for rest and recuperation, is a term used for the free time of a soldier or international UN staff serving in unaccompanied duty stations. The term is used by a number of such as the United States Armed Forces. The US Morale and Recreation network provides services for US military personnel. In the UK, the term applies to a type of leave granted to personnel during a deployment which allows them to return home to the UK to visit their family. This change was criticized by some in Europe, where prostitution is legal, all US military personnel serving in Vietnam during hostilities there were eligible for one R&R during their tour of duty. The duration of R&R was five days leave to R&R destinations, Hong Kong, Kuala Lampur, Manila, Singapore, due to their greater distance, seven days leave was permitted for R&R destinations Hawaii and Sydney. Bangkok was reportedly most popular with single GIs, Hawaii most popular with married GIs planning to holiday with spouses, the official policy of the United States Department of Defense was to suppress prostitution. 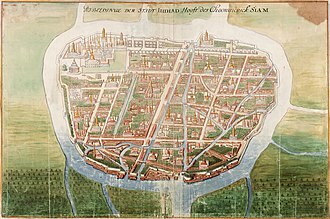 The Siege of Bangkok was a key event of the Siamese revolution of 1688, in which the Kingdom of Siam ousted the French from Siam. Following a coup détat, in which the pro-Western king Narai was replaced by Phetracha, the Siamese were able to muster about 40,000 troops, equipped with cannon, against the entrenched 200 French troops, but the military confrontation proved inconclusive. Tensions between the two belligerents progressively subsided, and finally a negotiated settlement was reached allowing the French to leave the country, with the end of the siege, a long period started during which Siam would remain suspicious of Western intervention. Only a few French missionaries were allowed to remain, while trade continued on a level with other European countries such as the Dutch Republic. King Narai had sought to expand relations with the French, as a counterweight to Portuguese and Dutch influence in his kingdom, and at the suggestion of his Greek councilor Constantine Phaulkon. 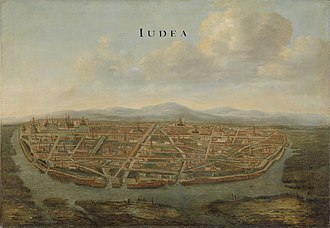 Numerous embassies were exchanged in both directions, including the embassy of Chevalier de Chaumont to Siam in 1685 and the embassy of Kosa Pan to France in 1686. This led to a dispatch of French ambassadors and troops to Siam in 1687. The embassy consisted of a French expeditionary force of 1,361 soldiers, envoys, the military wing was led by General Desfarges, and the diplomatic mission by Simon de la Loubère and Claude Céberet du Boullay, a director of the French East India Company. 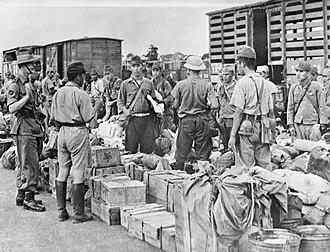 Desfarges had instructions to negotiate the establishment of troops in Mergui and Bangkok rather than the southern Songkla, King Narai agreed to the proposal, and a fortress was established in each of the two cities, which were commanded by French governors. Another 35 soldiers with three or four French officers were assigned to ships of the King of Siam, with a mission to fight piracy. The disembarkment of French troops in Bangkok and Mergui led to strong nationalist movements in Siam directed by the Mandarin and Commander of the Elephant Corps, by 1688 anti-foreign sentiments, mainly directed at the French and Phaulkon, were reaching their zenith. 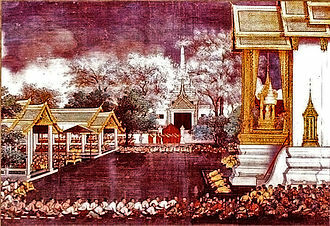 The Siamese mandarinate under the leadership of Phetracha complained about the occupation force, matters were brought to a head when King Narai fell gravely ill in March 1688. The Rama VIII Bridge is a cable-stayed bridge crossing the Chao Phraya River in Bangkok, Thailand. It was conceived to alleviate congestion on the nearby Phra Pinklao Bridge. Construction of the bridge took place from 1999 to 2002, the bridge was opened on 7 May 2002 and inaugurated on 20 September, which is the birth anniversary of the late King Ananda Mahidol, after whom it is named. The bridge has a design, with a single pylon in an inverted Y shape located on the western bank of the river. Its eighty-four cables are arranged in pairs on the side of the main span, the bridge has a main span of 300 metres, and was one of the worlds largest asymmetrical cable-stayed bridges at the time of its completion. Bangkok is divided by the Chao Phraya River into the eastern part and Thonburi in the west. By the mid-1990s, traffic congestion on these crossings had become particularly severe, Phra Pinklao Bridge, in particular, was regarded as the worst. The BMA contracted the British company Mott Macdonald and Thai companies Epsilon and P & Cigna to perform the preliminary survey, bidding on the project began in 1996, but was halted due to the 1997 Asian financial crisis. The bridges design was provided by Buckland & Taylor, its engineers Jorge Torrejon and Don Bergman served as project manager, both had previously worked on the Alex Fraser Bridge in Vancouver, which was the worlds longest cable-stayed bridge for five years following its completion in 1986. Construction of the bridge was carried out by the China State Construction Engineering Corp, BBR Systems supplied and installed the cables, and PPD Construction designed the viaducts. London-based Yee Associates served as architect, and Scott Wilson Kirkpatrick provided design management, Construction of the bridge began in 1999, and was completed in 2002. It was opened to traffic on 7 May that year, the bridge was named as a tribute to King Bhumibols brother, the late King Ananda Mahidol, who was known as Rama VIII as he was the eighth king of the Chakri Dynasty. The bridge was inaugurated by Bhumibol on 20 September 2002, the anniversary of Ananda Mahidols birth, the bridge is of an asymmetrical design, with a single pylon located on the Thonburi bank of the river. The Kingdom of Ayutthaya was a Siamese kingdom that existed from 1351 to 1767. In the sixteenth century, it was described by foreign traders as one of the biggest and wealthiest cities in the East, the court of King Narai had strong links with that of King Louis XIV of France, whose ambassadors compared the city in size and wealth to Paris. By 1550, the kingdoms vassals included some city-states in the Malay Peninsula, Lan Na and parts of Burma and this part of the Kingdoms history is sometimes referred to as The Ayutthayan Empire. In foreign accounts, Ayutthaya was called Siam, but many say the people of Ayutthaya called themselves Tai. 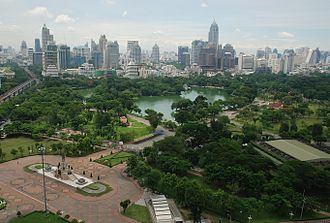 The name of the city indicates the influence of Hinduism in the region and it is believed that this city is associated with the Thai national epic, the Ramakien, which is the Thai version of the Ramayana. Ayutthaya began its hegemony by conquering northern kingdoms and city-states like Sukhothai, Kamphaeng Phet, before the end of the fifteenth century, Ayutthaya launched attacks on Angkor, the classical great power of the region. 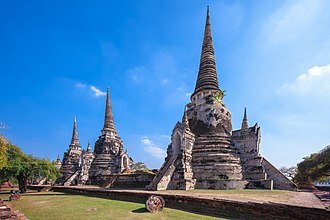 Angkors influence eventually faded from the Chao Phraya River Plain while Ayutthaya became a new great power, the emerging Kingdom of Ayutthaya was growing powerful. Yuttitthira urged Borommatrailokkanat to invade Phitsanulok, igniting the Ayutthaya-Lan Na War over the Upper Chao Phraya valley, in 1460, the governor of Chaliang surrendered to Tilokaraj. Borommatrailokkanat used a new strategy and concentrated on the wars with Lanna by moving the capital to Phitsanulok, Lan Na suffered setbacks and Tilokaraj eventually sued for peace in 1475. However, it was evident that from time to local revolts, led by local princes or kings. Beginning in the century, Ayutthaya showed an interest in the Malay Peninsula. Ayutthaya launched several abortive conquests against Malacca which was diplomatically and economically fortified by the support of Ming China. In the early fifteenth century the Ming admiral Zheng He had established a base of operation in the port city, under this protection, Malacca flourished, becoming one of Ayutthayas great foes until the capture of Malacca by the Portuguese. Taksin the Great or the King of Thonburi was the only King of the Thonburi Kingdom and was of Thai Chinese heritage. He was a leader in the liberation of Siam from Burmese occupation after the Second Fall of Ayutthaya in 1767, and he established the city Thonburi as the new capital, as the city Ayutthaya had been almost completely destroyed by the invaders. His reign was characterized by numerous wars, fought to repel new Burmese invasions and to subjugate the northern Thai kingdom of Lanna, the Laotian principalities, and a threatening Cambodia. He was executed and succeeded by his long-time friend Maha Ksatriyaseuk who assumed the throne, founding the Rattanakosin Kingdom and the Chakri dynasty, which rules Thailand to this day. Although warfare took up most of King Taksins time, he paid a great deal of attention to politics, economy, and he promoted trade and fostered relations with foreign countries including China and the Netherlands. He had roads built and canals dug, apart from restoring and renovating temples, the king attempted to revive literature, and various branches of the arts such as drama, painting and handicrafts. He issued regulations for the collection and arrangement of texts to promote education. In recognition for what he did for the Thais, he was awarded the title of Maharaj. Taksin was born on April 17,1734 in Ayutthaya and his father, Yong Saetae, who worked as a tax-collector, was a Teochew Chinese descent from Chenghai County, Guangdong Province, China. His mother, Lady Nok-iang, was Thai, impressed by the boy, Chao Phraya Chakri, who was the Samuhanayok in King Boromakots reign, adopted him and gave him the Thai name Sin meaning money or treasure. When he was 7, Sin was assigned to a monk named Thongdee to begin his education in a Buddhist monastery called Wat Kosawat, after seven years, he was sent by his stepfather to serve as a royal page. He studied Min Nan and several Indian languages, when Sin and his friend Thong-Duang were Buddhist novices, they reportedly met a Chinese fortune-teller who told them that both had lucky lines in their hands and would both become kings. Neither took it seriously, but Thong-Duang would become the successor of King Taksin, in 1764, the Burmese army attacked the southern region of Thailand. Phra Racha Wang Derm, the former royal palace of King Taksin, now used as the Royal Thai Navy's HQ, view form Phra Prang of Wat Arun, Thonburi, Bangkok. Chao Phraya Chakri, later Phutthayotfa Chulalok or Rama I.
French soldiers in Siam, 17th century Siamese painting. The fortress in Thonburi, on the right (western) side of the Chao Phraya, in front of the Bangkok fortress. 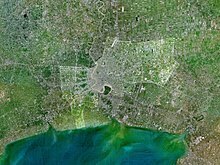 The Chao Phraya, from Bangkok (left) to the sea (right), was lined with forts and blocked with barrages. Lion Throne in the throne hall of the royal palace of Amarapura (Painting by Colesworthy Grant, 1855. The last king, Thibaw Min (right), here with Queen Supayalat and her sister Princess Supayagyi, was forcibly deposed in a war with the British colonialists in 1885. Sathon District from the Yan Nawa District. A page from Simon de La Loubère : Du Royaume de Siam. 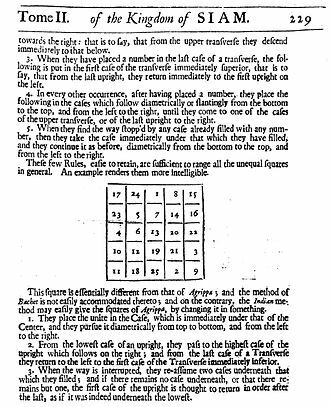 Illustration from the English edition (1693). 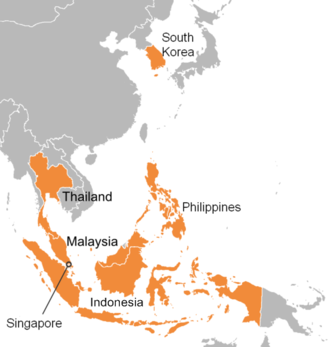 The Tiger Cub Economies (yellow) consist of five countries, Indonesia, Malaysia, Philippines, Thailand, Vietnam. Also shown are the original tigers (in red). Buddhist temple of Kinkaku-ji, declared a World Heritage Site by UNESCO.